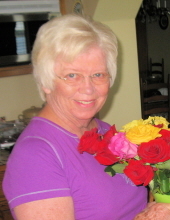 Sally Feagin, 75, of Cobb, died Sunday, March 17, 2019 at Crisp Regional Hospital in Cordele. A native of Clayton, NY, she was born June 16, 1943 to the late Earl Garnsey and Ina Lindsay Garnsey. She was a member of Grindstone Methodist Church in New York and attended Lakeview Baptist Church in Cobb. A memorial service will be held at 11:00 a.m., Thursday, March 21, 2019 at Greg Hancock Funeral Chapel in Americus with Rev. Bryan Bentley officiating. The family will receive friends at 10:00 a.m., an hour prior to the service, at the funeral home. Survivors include her husband of thirty-four years Edwin “Ed” Feagin of Cobb; daughter, Stacy Feagin Lubniewski of Bonaire; a sister, Leota Wood of Cape Vincent, NY; and a granddaughter, Madeline Lubniewski. The family suggests memorial contributions be made to The Georgia Sheriff’s Boys Ranch, 5671 GA-122, Hahira, GA 31632, or to Lakeview Baptist Church, 472 Flintside Drive, Cobb, GA 31735. In addition to her parents, she was preceded in death by five brothers and three sisters. To send flowers or a remembrance gift to the family of Sally Feagin, please visit our Tribute Store. "Email Address" would like to share the life celebration of Sally Feagin. Click on the "link" to go to share a favorite memory or leave a condolence message for the family.